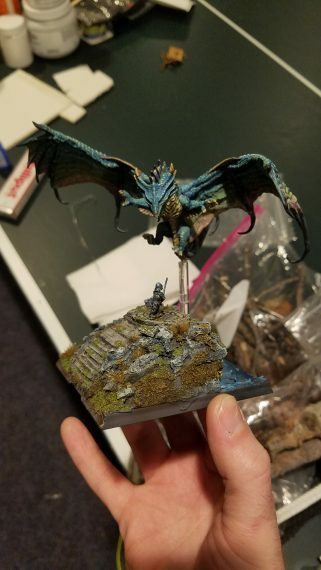 As a fun way to end 2017, I entered in to a local painting competition. In this brief article, I'll offer some insight as to my creative process for this particular piece. It was a bit of a rush as I entered with around 10 days until the submission deadline! But I'm also of the mindset that impending deadlines can do wonders for motivation. I took a long look at the initial model that I picked out. 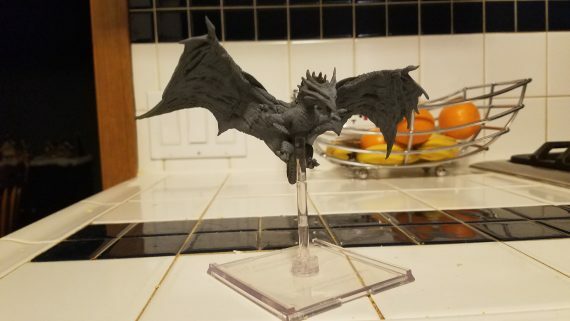 There were 2 (remaining) choices of a reprimed D&D Attack Wing dragon. I chose the one that 'called' out to me more. 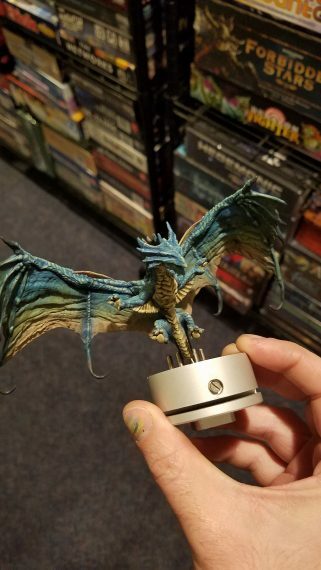 It's easier to paint models that you enjoy looking at! I think that's one of the more critical aspects of painting that's often overlooked. 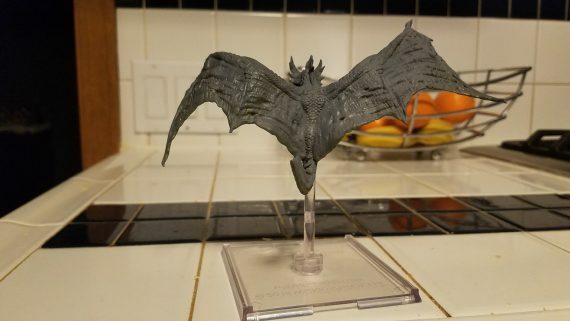 The rules of the contest said we were free to modify the model as we saw fit. First off, I didn't like the position of the flight stand. 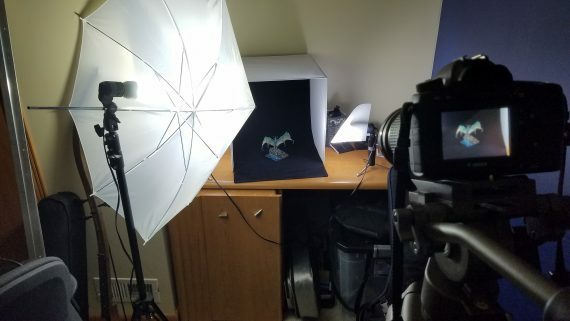 To me, it looked like the dragon was pole dancing, and the connection was smack dab in the middle of the belly. 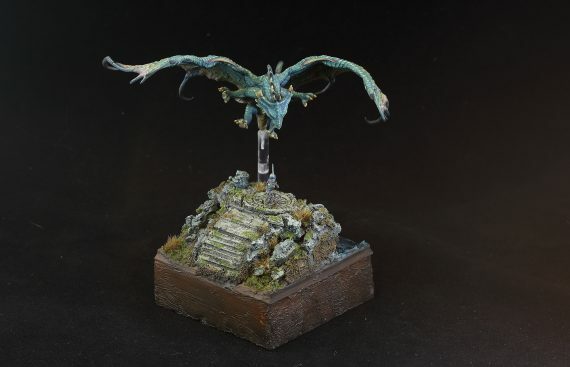 How do you even paint something like that? So, I cut that portion off and roughly resculpted the belly with some green stuff. I pinned a metal rod (paperclip) in to the tail region underneath, where I would reconnect the flight stand. This felt visually better and didn't hide the dragon as much. 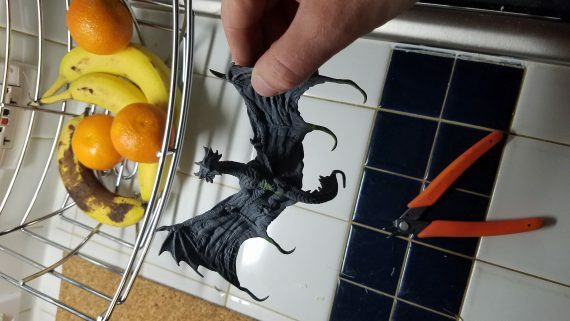 With some excess green stuff, instead of wasting it, I felt inspired by something like butterfly wings and extended the wing structures slightly. 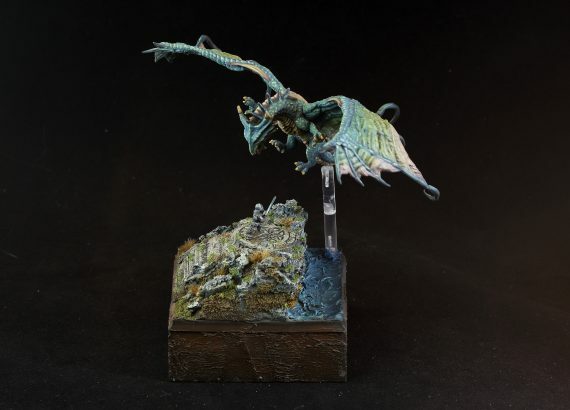 I think this was a very subtle effect, as not many people noticed, but to me it gave a more exotic feel to the dragon. 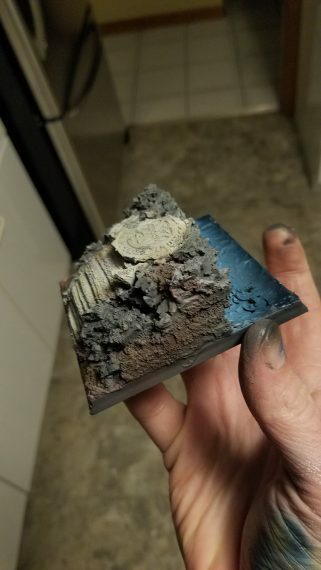 Next up, a scratch made base. 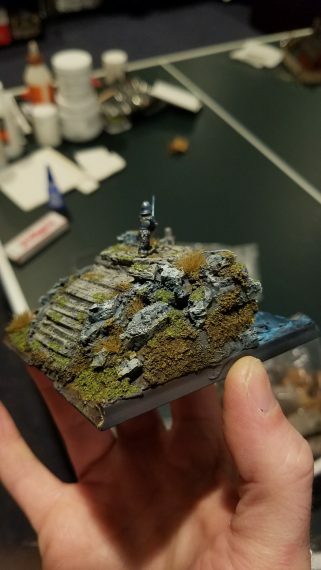 I've been on a diorama/vignette kick when it comes to figure painting over the last 4 months. I didn't want to go just the glue/sand route for an event where I had complete freedom. 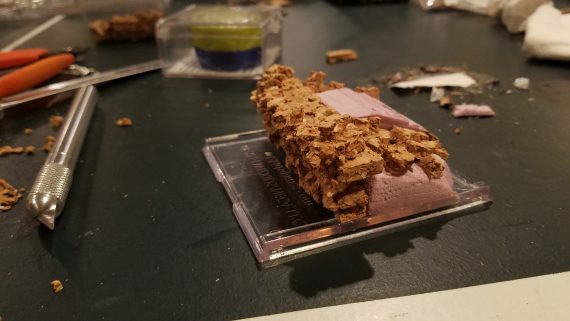 So, I cut up some pink foam scraps, and ripped up some cork sheet pieces and put together a sort of ruined dais. I had a vision in my head of a knight, climbing up the dais steps to rid the land of a dragon, terrorizing this land for ages. 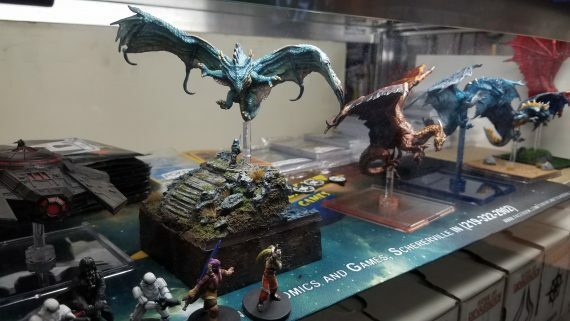 Thats another important part of this hobby to me. The best projects tell a story. 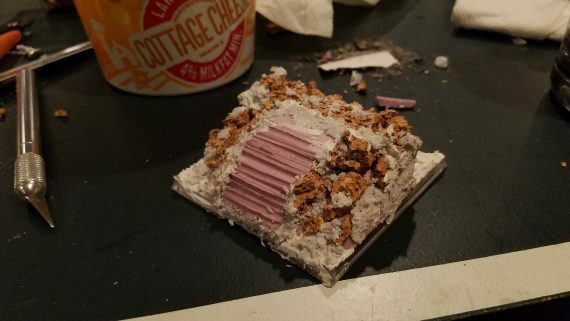 Once the core of the base was built up, I refortified it all with some modeling paste, and texture paste in various areas. I use this to fill in some glaring gaps, and give a more natural, uneven look to the materials. 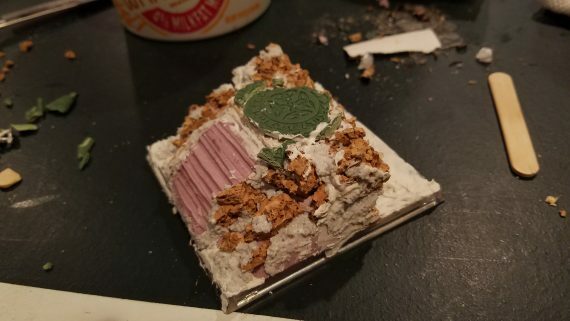 I also used some greenstuff and rollers to create some ornamentation on the dais, and make it look like celtic ruins. I let all that dry over a few hours. While doing so, I dug out a tiny 15mm knight mini I picked up super cheap a long while back. I was happy I found a use for it! I decided to try my hand at painting this little dude, probably to a higher standard than I should have, haha...but I had time to kill. 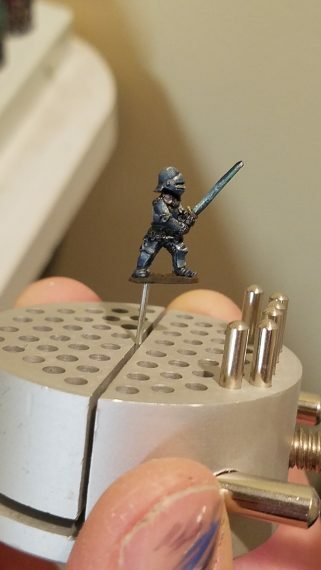 So, yes, I did do tmm shading on a little 15mm guy. Once dry, I got to priming. 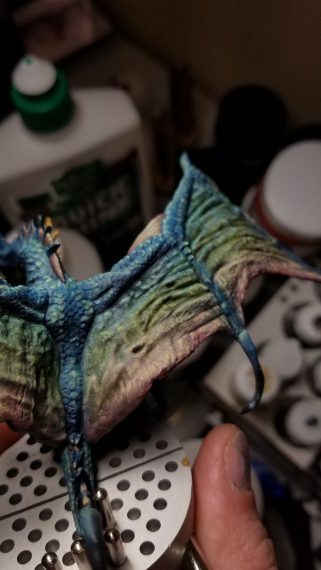 I didnt like the initial gray spray primer on the dragon so I did some zenithal highlighting with airbrush primer. 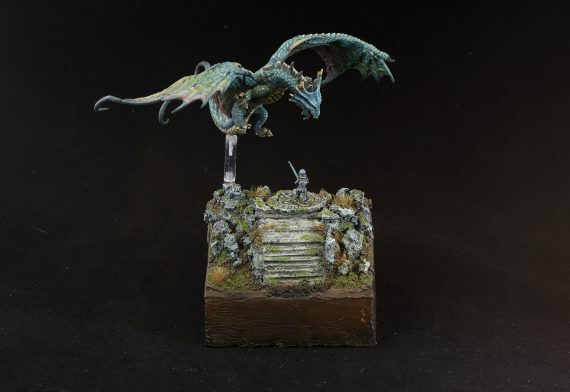 Similarly with the base. 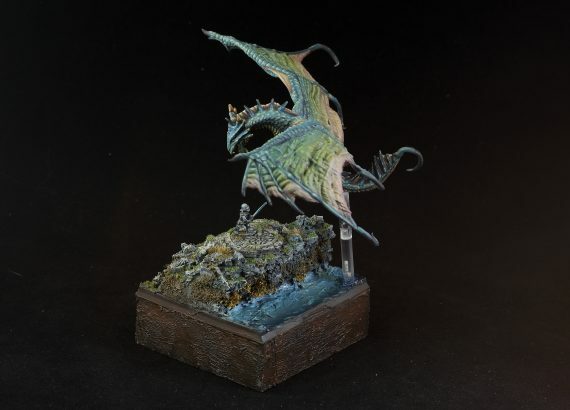 I then added some airbrushed base colors to both the base and dragon. 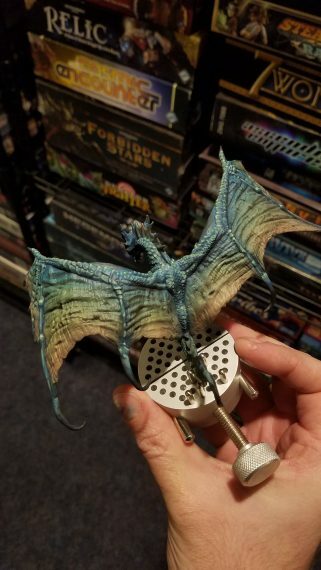 For the dragon, I still felt inspired by butterfly colorings, so I went with a blue to yellow transition. 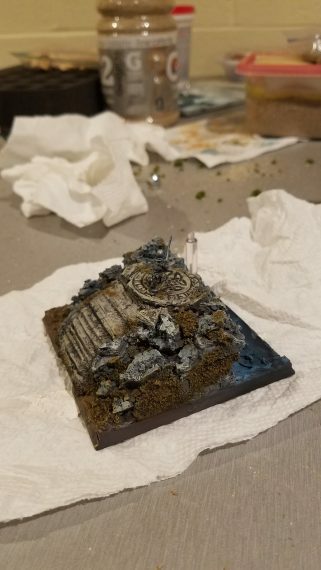 The base itself, has a cliffside sea portion (also sculpted in modeling paste, pushed around with some dental tools), so I made sure to paint that in some blue gradients. All of this was night 1! I felt that strong surge of creative impulse and just ran with it. 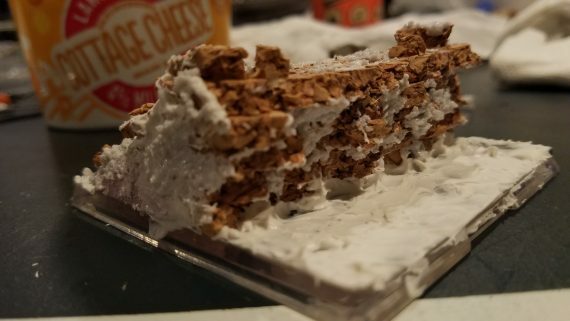 Some of these were brand new techniques to me, so I learned a lot by experimentation, and was rather proud of what I accomplished in my hobby frenzy. The next day I got to washing, and adding drybrushing and shades to the base. 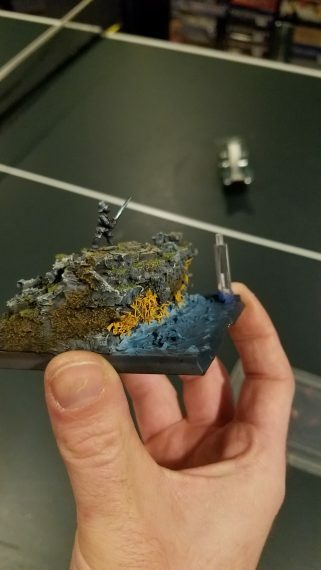 I also flocked parts of the base, added tufts and lichen on the cliffs near the water. Note: I also used some inks to darken parts of the grass tufts and lichen to make them blend in better with the base. Sort of a uniformity in color. Over the next few days (Christmas holidays and work ate up much of my time.) 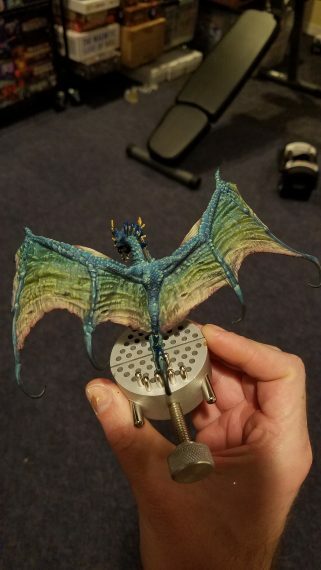 I squeezed in a few hours here and there to really get to highlighting the dragon scales and wings. I used a lot of glazes to bring colors up or down, and quick highlights where I thought the light would catch sharper edges. This was kind of a tedious process, and is hard to describe step by step as you're just adding layers as you see fit. 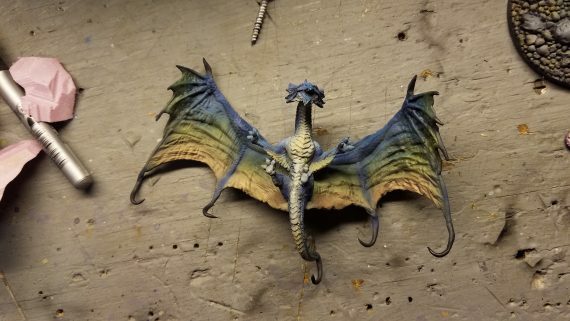 I highlighted blues with greens and yellows, and the yellowish parts of the wings with lighter flesh tones, which I felt gave it a more lifelike look. 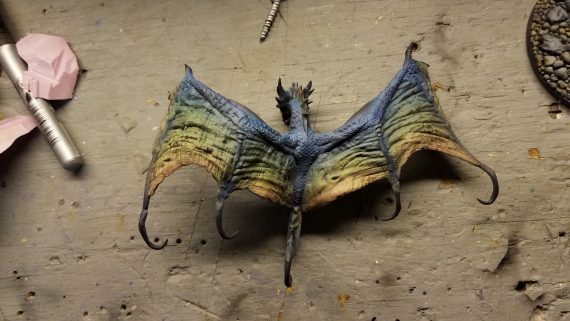 Subtle fading with some dark reds and purples on the lighter parts of the wings. You can see how various layers shifts the colors towards different hues. In this instance, how the greens seem more vibrant in the wing flaps. After all was basically finished, I took a step back and looked at what I made. Quite a bit different than what I started with! However, I worried how people would handle it, so I decided to build a stage for the base so it's easier to turn at different angles. 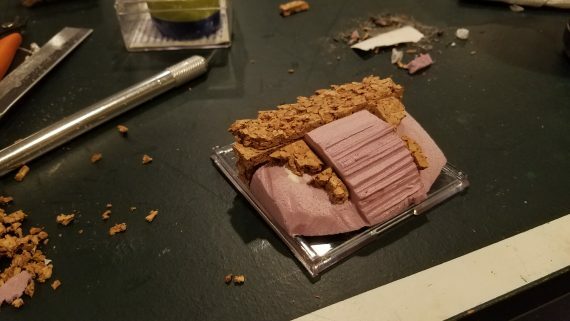 I just measured the base and made this out of pink foam. 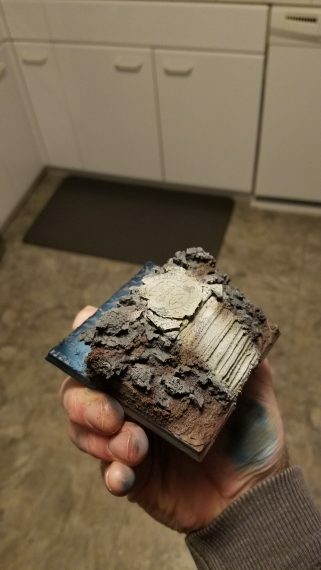 I covered this in modeling paste, smoothed it out a little and painted it brownish, as if a literal piece of that world was pulled out. Yikes! Not sure I'd want lots of people to handle this in this manner. I put all of this in to a photo booth for some decent pictures for myself. The contest pics taken in shop and advertised weren't the greatest, haha. There's definitely a skill to mini photography, which can be a hobby in itself. 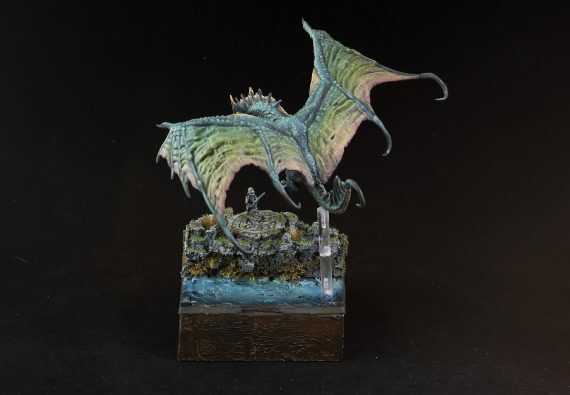 I did win first place out of some 13+ dragons submitted and a small prize. This was just a local contest, but a nice way to get my feet wet and see how the pressure could inspire me. Perhaps someday I'll aim to compete in larger competitions where perhaps I'll find myself really pushing towards learning new techniques. I'm also quite proud of my two friends' submissions. 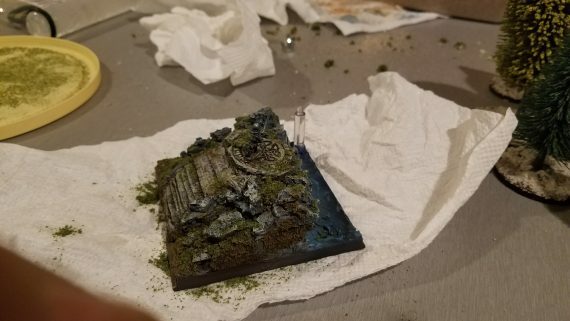 They did an outstanding job themselves, (one just having started this insane mini painting journey!) and probably deserved more credit for what they accomplished. Cheers guys! Fantastic work! 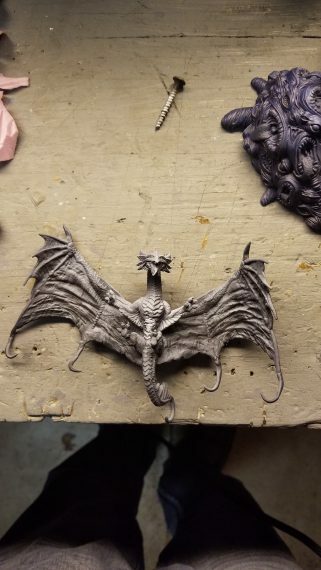 Really love how the dragon’s wings turned out. You achieved at less than half the size, a visual impact that most others would struggle to achieve at double that size or more. Thanks for the feedback guys, I really appreciate it! Really beautifully done. The layering and transitions look amazing!